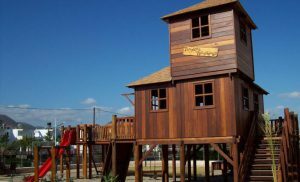 This spectacular treehouse project embodies two essential elements of treehouse living: escape and shared experience. 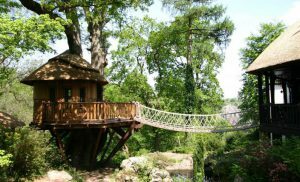 With a treehouse village for the young ones and a tranquil lake house for the adults, everyone in the family has their own space to escape to. A gleaming copper roof among two other fairy-tale turrets is the first thing that catches your eye. 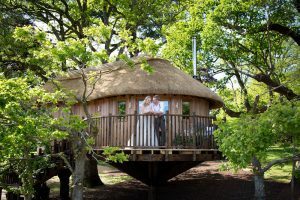 Each treehouse ‘At The Water’s Edge’ is individually designed, inside and out, so that the children all have their own personal spaces to retreat to. For rainy days there are cosy bay windows overlooking the garden. Indiana-Jones style rope bridges connect the decks together, and fun cargo nets offer alternative access to the rough-hewn staircases. The Lake House with its private gym and luxury shower room is the ultimate getaway for busy grown-ups. Panelled with floor-to-ceiling windows, the crescent-shaped building sits on a decked platform overlooking the koi carp lake; it’s the perfect space for sunbathing or dining al-fresco with friends. On hot summer days, cool off with a swim in the pool made from bespoke tiling and a hand-made waterfall. When it’s not needed, the pool is cleverly concealed under bespoke decking which gives even more space. The small island sitting in the middle of the lake is a wonderful place to sit with a good book under the shady willow tree. In the evenings, the specially installed mood lighting across the decking can be altered using an innovative high-tech iPad system.